ISLAMABAD: Member National Assembly (MNA) Rana Muhammad Afzal Khan took oath as minister of state for finance on Tuesday. 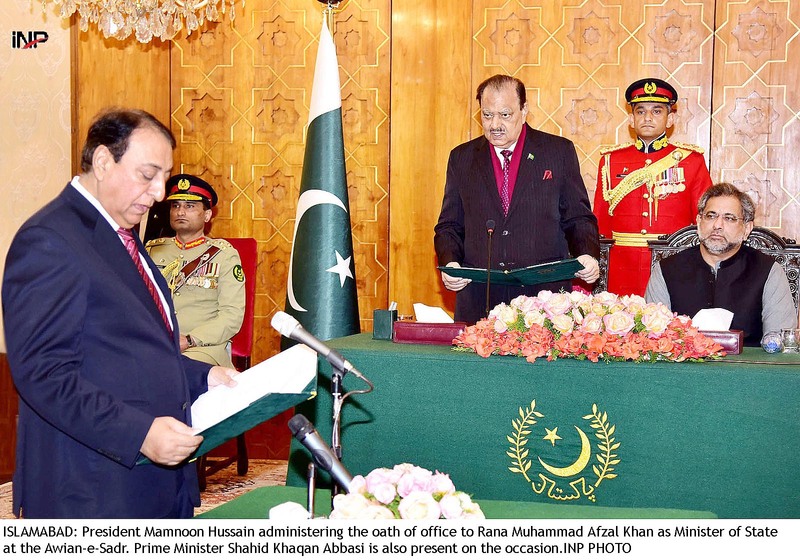 President Mamnoon Hussain administered the oath to him at a ceremony held at President’s House. The president congratulated the new minister of state for finance and hoped he would discharge his professional responsibilities efficiently. Afzal, who was till now performing the duties of parliamentary secretary for finance, will now be in charge of Finance Ministry as the former finance minister Ishaq Dar is on long medical leave in London. His appointment comes a month after federal finance minister Ishaq Dar requested the PM for a leave, after which the top job in the Ministry of Finance was left vacant. Since the change of cabinet following the disqualification of former prime minister Nawaz Sharif and subsequent cases against Ishaq Dar—which apparently forced him to remain out of the country—the important ministry was being run directly or indirectly by various individuals. PM Abbasi allowed his Special Assistant on Economic Affairs Miftah Ismail to run the affairs of the ministry; however, Ishaq Dar instructed the ministry’s officials to only follow him; thus practically running the ministry through telephone and Whatsapp calls. According to sources, the government wanted to appoint a federal minister to look after the important ministry; however, the plan failed after objection from the Sharif Family—which still wished Dar to run the affairs of the ministry. “Dar still has a say in the ministry of finance, as he enjoys the portfolio of a federal minister,” the sources added. However, Dar had to go on a leave following immense pressure from the government and financial institutions. Principal Secretary of PM Abbasi, Fawad Hassan Fawad, also had his stint indirectly running the affairs of the ministry, keeping Miftah Ismail as the front man. Affairs of revenue division were being supervised by Haroon Akhtar, who is the advisor to PM on revenue. The appointment of Rana Afzal Khan as minister of state for finance is an important step by the federal government as the budget for the fiscal year 2018-19 will be presented in the National Assembly in May 2018. Earlier, Ministry of Finance had issued the budget circular of the year 2018-19. According to the circular, the budget will be announced in the first week of May. The information has been passed on to all the relevant divisions and ministries that the government will present the budget strategy paper to the cabinet in February.